Chimney starters use convection (the driving force in a fireplace chimney, hence the name) to light charcoal quickly and reliably. 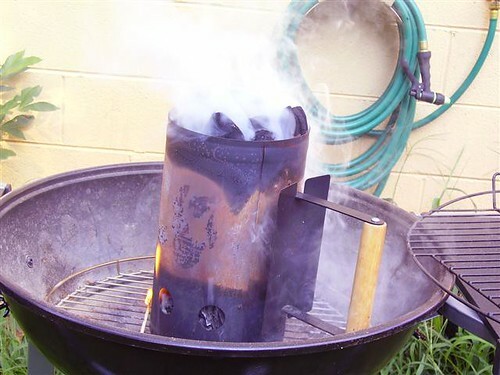 Charcoal aficionados swear by them because of their speed and reliability, and also because they don’t require the addition of accelerants like lighter fluid, which some people believe imparts a chemical taste to food. Likewise, there is no need for any “fast light” charcoal with a chimney starter (which is shunned by experts for the same reason). There are other “fire and forget” systems for lighting charcoal, but this is likely the cheapest and most effective. Step two: Drizzle a little bit of oil on one full sheet of newspaper. The newspaper gets crumpled up and stuffed into the bottom of the chimney starter, where it acts as the ignition source for the charcoal. The oil will act as an additional source of fuel, and will ensure that the newspaper does not burn out before the charcoal is adequately lit. Step the third: Crumple the newspaper and stuff it loosely into the bottom of the chimney starter. Do not use more than one sheet. Do not crumple the paper too tightly. Doing either will not allow adequate airflow around the newspaper, which might cause your fire to go out before the coals are fully lit. Having done that, set the chimney starter upright on the coal grate of your grill, and fill the top portion of the starter with briquettes or lump charcoal. 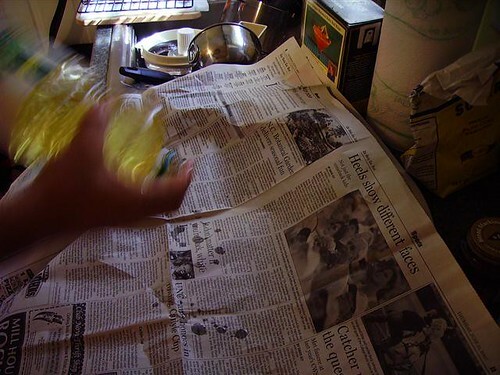 Step number four: Light the newspaper in three or four spots through the holes around the bottom section of the starter. Now, relax with an ice-cold beverage of your choice for about 15-20 minutes. Your chimney starter will shortly start erupting smoke from the opening at the top. This is normal and healthy. It happens to all chimney starters at some point in their lives. Don’t be embarrassed. You may notice your chimney starter’s voice breaking from time to time as well. In about a beer or a beer and a half, the coals at the top of the chimney starter will begin to ash over. You will also notice an eerie red glow emanating from deep within the coal chamber. Fear not the Balrog; this is a sign of coals well-lit. Step 5: Grasp the chimney starter by the handle and turn out the coals onto your coal grate. 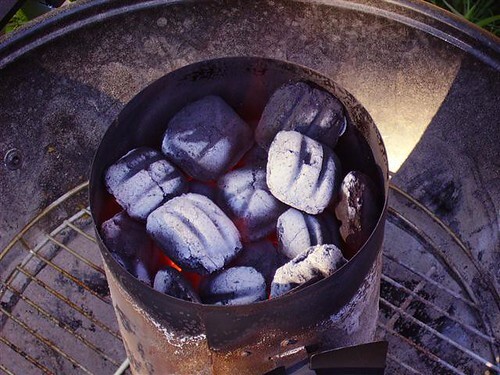 There are many different ways one could configure the coals, and pictured here is a pretty standard “two-level” fire–the coals are piled up on one side, providing a hotter region, and one side of the grill is bereft of coals, to make a cooler area. This way, items can be seared over the hotter part of the grill and moved to the cooler part to cook through. 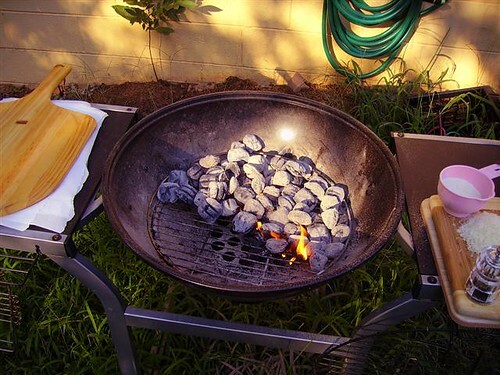 If some of the coals do not fall where you want them, just use some long barbecue tongs to arrange them where they should be. Step six and the last: Place your cooking grate in position, and using a rag or some paper towels dampened with cooking oil, wipe down the grate. 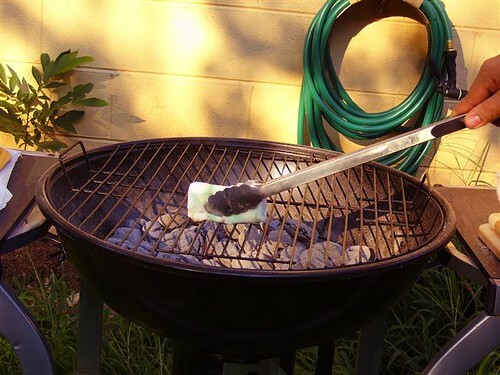 This will clean crud off the grate and prevent the food you’re cooking from sticking to the grill. That’s all there is to it! Enjoy the primitive expression of humanity’s might that is fire! PS: As this is the first “instructional” post, as well as the first post with pictures, any feedback on layout or other such commentary would be greatly appreciated. Thanks! < Previous Of interest to the Harry Potter fans in the audience…. Great post, extremely useful pics and info. But why do you demand people be logged in to wordpress to comment? Not everyone has a wordpress blog… you’re definitely limiting your potential circle of commenters, there. Changed. I think that I originally had it checked because I wasn’t sure how the moderation system was going to work out. But since I’m hand-moderating anyway, I don’t think I need it. Yay no required login! I’m allergic to required logins. 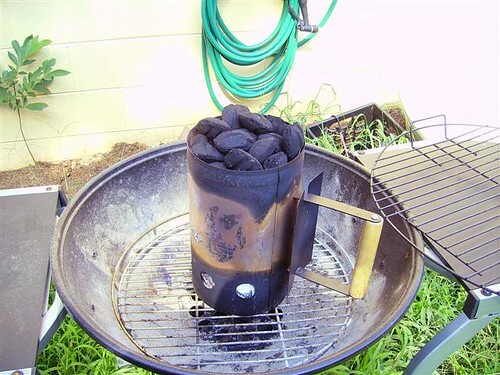 Have you given any thought to a DIY smoker, btw? I’m thinking of trying out the Alton Brown flowerpot smoker one weekend when the weather is cool enough. Actually, I had a kind of crazy thought. It would not be remotely hard to attach a piece of laundry vent tubing where the ash catcher for my grill attaches. I’ve also got one of those little “smoky joe” grills. I’m thinking of using the smoky joe as a furnace box for some good smokable material, and then somehow attaching it via ductwork to the underside of my large grill, so the large grill will act as a cold smoker. 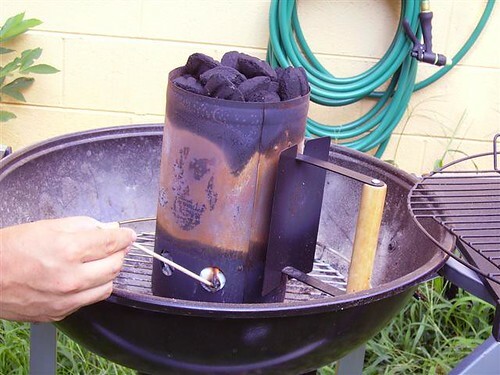 There might even be a way to set it up as a hot smoker by minimizing the length of the tubing. Maybe I should draw a picture. The biggest problem with the Alton Brown flowerpot smoker is that you have to take the whole thing apart (well, move the meat out of the way) to replenish smokable material, and it sounds like your scheme would bypass that. Could you not also use a fan on the smoky joe to fan the fire to regulate temperature and switch from cold smoking and hot smoking? Then you only need one section of ductwork. 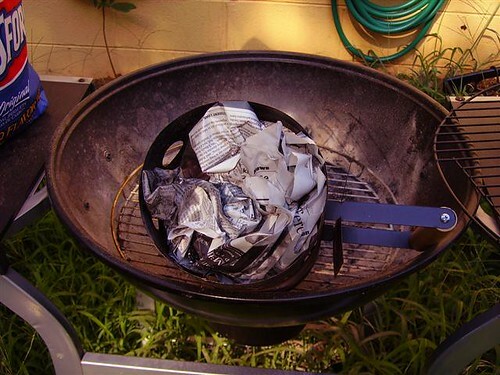 If memory serves me correctly, Alton Brown’s azalea smoker is a hot smoker–he also has a cardboard box hot smoker which is a little easier to work with, since you can cut a door into the side to change out the wood chips without disturbing the meat. I think that the temperature of the smoke in my Frankensmoker would be largely dependent on the length of the ductwork regardless of the exact setup–to get the smoke temperature down to 80 degrees just doesn’t seem feasible with a short duct, and keep in mind that a hot smoker should be running at about 200. That’d just be too big a gap as far as I can imagine. (I could be wrong.) I think what would be ideal would be a piece of extensible tubing of some kind. I don’t know if this exists for home heating applications, though. I think with the right assemblage of pieces it would not be too hard to replenish the smoker. I bet there’s a piece of furnace exhaust cowl that’s about the size of the smoky joe’s lid. As for a fan, a smaller piece of ductwork connecting to the smoky joe’s air intake and a small desk fan would probably take care of that. This might be a requirement since the addition of the smoking ductwork would impede airflow and potentially choke off the fire. 80 degrees? Are you telling me that the interweb has provided me with misleading information? Yeah, that really would have to be two different lengths of duct. I’m think that fanning the fire could get you a decent variation in temperature, but not 80 to 200. The hot smoker would probably be a lot easier to manage, unless you set up a cooling rig on the ductwork for the cold smoker (maybe run it through a tub of water or something).